No. 5-7, Laluan Perusahaan Kledang 5, Taman Perindustrian Chandan Raya, Menglembu, 31450 Ipoh, Perak, Malaysia. 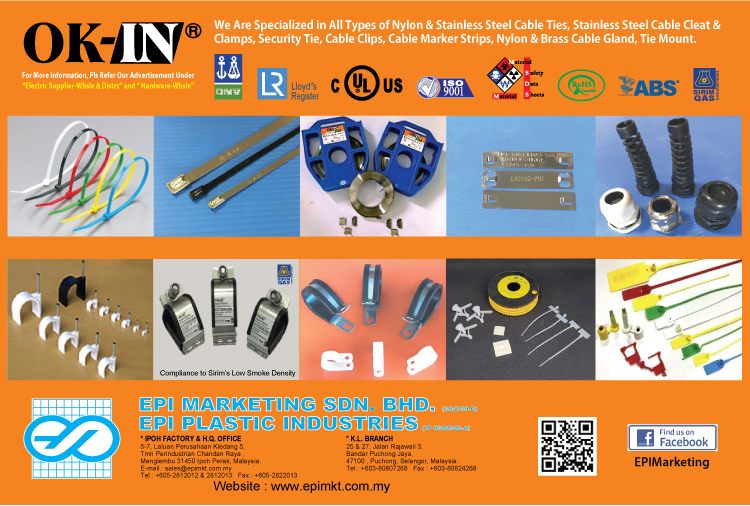 The firm was then changed to EPI Plastic Industries Sdn. Bhd. on 16th June 1994. The company remains in manufacturing and sale of Electrical accessories. With as expansion plan moving forward, EPI Plastic Industries Sdn. Bhd. name was changed on 9th September 2004 to EPI Marketing Sdn. Bhd. 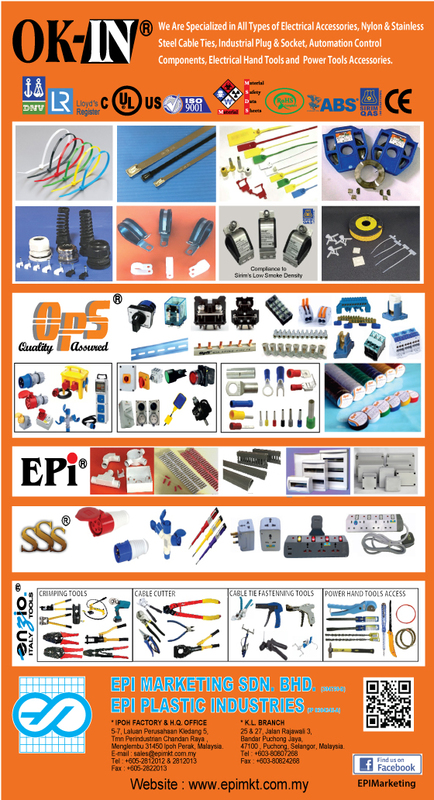 to reflect the inclusion of the General Hardware and Electrical products. The company are primarily involved in import and distributing well wide range of industrial product and focus on three main areas of business-electrical, hardware and industries supplies. Our company's plastic components, electrical products, power tools accessories and hand tools are certified by relevant authorities. 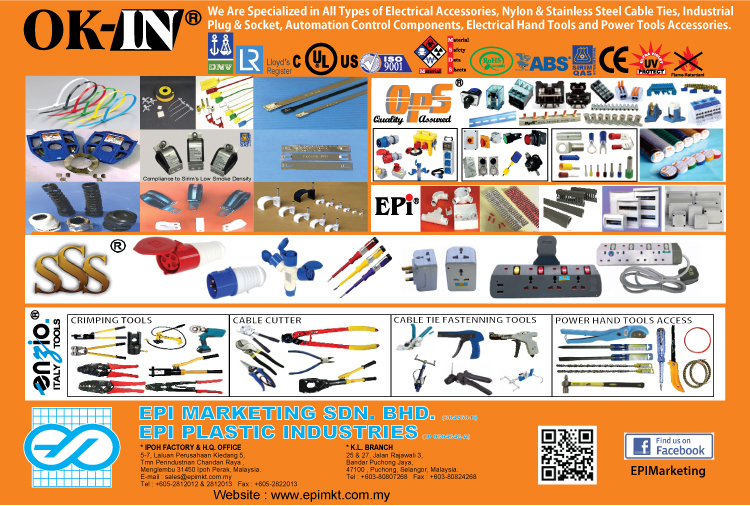 Also we are Manufacturer and Distributor brands of the EPI, OK-IN, OPS, SSQ, SSS, ENZIO, BENZ WERKZ. A) EPI manufactured plastic accessories for Electrical Industry for use in the wiring installation in the building construction industry. > Plug / Socket for homes, shops, offices, building and etc. > Low voltage switchgears and control item used in distribution boards for Homes, shops, offices and building etc. For manufactured plastic components and imported electrical products - Good business contacts as business was established 22 years ago in 1991. Part of it's components and electrical hardware products are sold to distributors, wholesaler, retailer and oversea market. The company has the ability via their own professional marketers to study and analyze more product range which they are familiar with and to add them to their product whenever any products meet their profit and growth criteria. The company was established since 1991, therefore it has a steady pool of existing customers for its plastic components, electrical and hardware products. With a strong sales team, the company is very much sales focused and would contribute greatly to its sales growth.